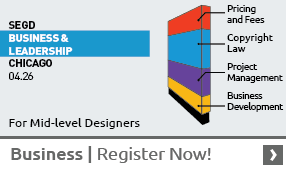 Listen, Learn, Be Inspired by Atlanta's own SEGD Fellow, JAN LORENC! 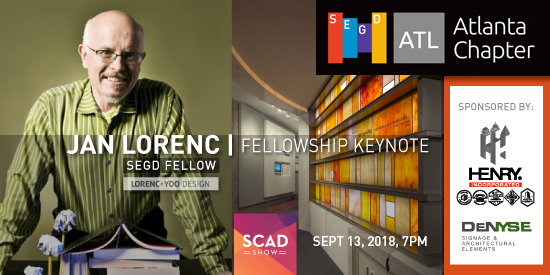 SEGD Atlanta is honored to present the opportunity to spend an evening with Atlanta design legend and SEGD Fellow, Jan Lorenc at SCAD Show! From award-winning museum spaces, trade show exhibits, sculptures, wayfinding and placemaking, Jan has an incredibly impressive design resume! And a client list that is equally impressive: Delta, the Mayo Clinic, Sony, Hyatt, Portman, tvs design, Samsung, UPS, and many others. Holding degrees in industrial design, architecture and visual communication, he and his multi-disciplinary firm have received numerous honors and awards since the founding of Lorenc+Yoo Design www.lorencyoodesign.com in 1978. This past year Jan was named SEGD Fellow at the 2017 SEGD Conference Experience Miami, sharing this honor with the likes of Massimo Vignelli, Lance Wyman, Deborah Sussman, Robert Venturi, Ivan Chermayeff, David Gibson, among others. He is the author of “What Is Exhibition Design?” and serves as a frequent design lecturer and adjunct professor of exhibition design at Savannah College of Art and Design (SCAD), as well as at the Georgia Institute of Technology. Come out to SCAD Show and take a deep dive into the incredible personal, cultural, and international experiences that have inspired Jan Lorenc's auspicious design career and legacy.